A stunningly beautiful glowing display, this act is perfect for indoor functions. Our mesmerizing UV/Glow performance lights up the stage in an explosion of colored lights and movement. 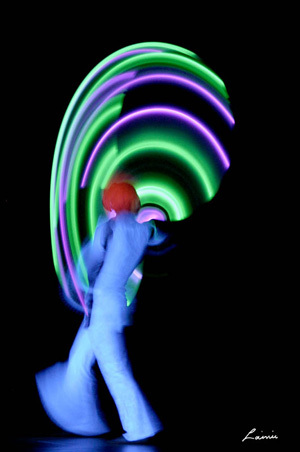 The light performances features high energy glow poi, glowing baton spinning, ribbon dance inspired by Chinese ribbon, glowing hula hoops and glow juggling with state of the art illuminated equipment, combined with choreographed dance, all set to an original soundtrack. The UV / Glow act can be performed solo, or as a duet. Check out our Fire Demo Video or Ultraviolet Gallery.